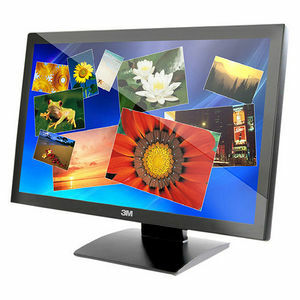 The 21.5-inch 3M Multi-Touch Display M2167PW takes interactive display technology to the next level by combining uncompromising multi-touch performance, brilliant high-definition graphics, wide viewing angles and elegant product design into a fully-integrated, easy-to-use, plug-and-play multi-touch desktop device. The 3M Multi-Touch Display M2167PW incorporates 3M Projected Capacitive Technology and offers full multi-touch capabilities with less than 6 millisecond response time for 20 simultaneous touches. This means fast, accurate touch response over the entire touch surface.